With huskies we will cover nearly 300 kilometres in perhaps one of Sweden’s most mythical areas, varied with high mountains, deep valleys, old forests and winding rivers. Our journey goes from Saltoluokta, through Sarek National Park, past Sweden’s most inaccessible point and down along the Padjelanta trail to Kvikkjokk. From this little mountain village we head north, along the well known King’s trail and go back to Saltoluokta Mountain Station. The sunset’s, the taste of fresh made reindeer stew, the companionship with the dogs and the feeling of lying in a warm sleeping bag while the snowstorm is roaring outside the tent are memories you never want to be without! The morning starts by the fireplace in the restaurant with a delicious breakfast buffet with home baked bread directly from the oven. After breakfast we pack everything we need for the week in our sleds and you get instructions in how to drive and handle your team of huskies. Together we harness the dogs and put them in front of the sleds and get the teams are ready for take off. This first day we head for Rissajaure where we are going to set a tent camp for our first night. The stage for the day are relatively short but it’s a lot of new things to learn, how to take care of the dogs, how to set up a tent etc. Everything takes time in the beginning before all routines fall into place. We fetch water in a stream and if needed we dig snow walls for the tent. The area is nice for a short snowshoe walk if you like. We travel through Sarek National Park to the southwest. We go down to the upper end of Rapavalley, Sarvesvagge or Alkavagge towards Padjelanta. The weather and snow conditions will decide our exact route these days. Since there are no accessible cabins in Sarek we have to rely on our tents, which will make us more free and independent in our choices. We go down through the upper Tarravalley by the Tarraluopal cabins. From here we will follow the Padjelanta trail down through the Tarravalley to Kvikkjokk, a small mountain village by the end of the road. From Kvikkjokk we head north along the King’s Trail back to Saltoluokta. In these days we will travel along marked trails with the possibility to spend the nights in nice cabins. From the Sitojaure cabins we travel up over the bare mountain back to Saltoluokta. 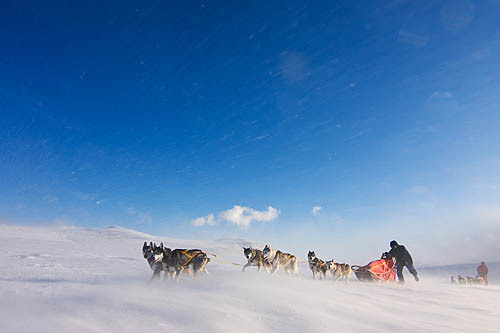 During this your last day with the dogs you will be amazed about your progress as a musher. Arrival to Saltoluokta Mountain Station. Here we will enjoy a hot sauna, warm showers and a three course dinner in the restaurant. Breakfast and then departure from Saltoluokta Mountain Station. Demanding and sometimes hard. This tour is more like a real expedition in a wild area without marked trails. Some outdoor experience is required. In wilderness cabin we sleep on bunk beds in mixed room with both gentlemen’s and women’s. Dry toilet is available around the cabins but when we camp in tent we dig a hole in the snow. The wilderness cabins are heated with wood/gas and have no electricity or running water. You also need to have in mind that you will be physically active outside in the cold for many hours each day and most of the nights are spent in tents. You need to have some outdoor experience with camping since before. This is more like a real expedition in a wild area without marked trails. Our tours are not made up touristic adventures but real experiences where everybody work as a team and helps with everything from taking care of the dogs, cooking, loading the sleds, fetching water and setting up tents etc. within the shortest possible time after we receive your order. credit card details are held for security purposes only.